CHICAGO (WLS) -- If you've ever driven around Chicago looking for street parking you know there's no such thing as a free ride, or a free place to park. But, chances are you've seen personal vehicles with an official looking neon vest hanging from a window or draped on the dashboard. These vehicles are often parked in prime spots. Angry motorists, who either had to pay to park or could not find legal spots for their cars, told the I-Team they are tired of seeing so many cars using official-looking neon vests to skirt the system. For more than a year, the I-Team has been watching and investigating whether those vests act as unofficial passes, signaling ticket writers to look the other way. Many frustrated motorists who either had to pay to park or were angry they could not find legal spots for their cars told the I-Team they are tired of seeing so many cars using vests to skirt the system. Consumer activist Mike Brockway, the author of The Expired Meter website, said frustrated Chicago motorists have noticed this practice and complain that ticket writers pass up the vehicles with neon vests. Other critics call it Chicago's "professional courtesy" given to city workers and construction crews, or possibly anyone with a safety vest looking for a deal on parking their personal car. The city has always maintained that "free parking" doesn't exist on central city streets. 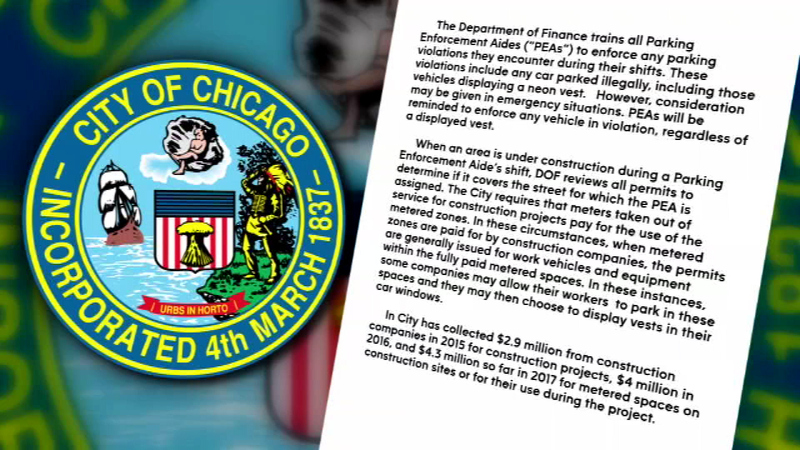 In a statement to the I-Team, city officials said they do arrange special parking permits for construction companies to park work vehicles around building zones. Although not spelled out in the paperwork, city officials said some construction companies may allow workers to park personal vehicles in these spaces and display vests in their windows. They also said construction companies will reimburse the city for lost parking revenue. In 2016 they claim to have collected $4 million dollars and $4.3 million so far in 2017. P.S. Sriraj, Ph.D. is the Director of the UIC Urban Transportation Center and studies urban transportation problems and travel behavior. He said enforcement needs to be on top of the game in terms of making sure no one is throwing up a vest and trying to get away with free parking. He also acknowledged that parking enforcement aides can't be everywhere and that there will be isolated instances of motorists trying to abuse the system. City officials explained that some private vehicles could be given special consideration in emergency situations. When first asked by the I-Team about the regular use of vests for free parking, city officials said that parking enforcement aides would be reminded that the rules apply to any vehicle in violation, regardless of a displayed vest. Within a couple days of our inquiries, the I-Team noticed more tickets on vehicles with vests.